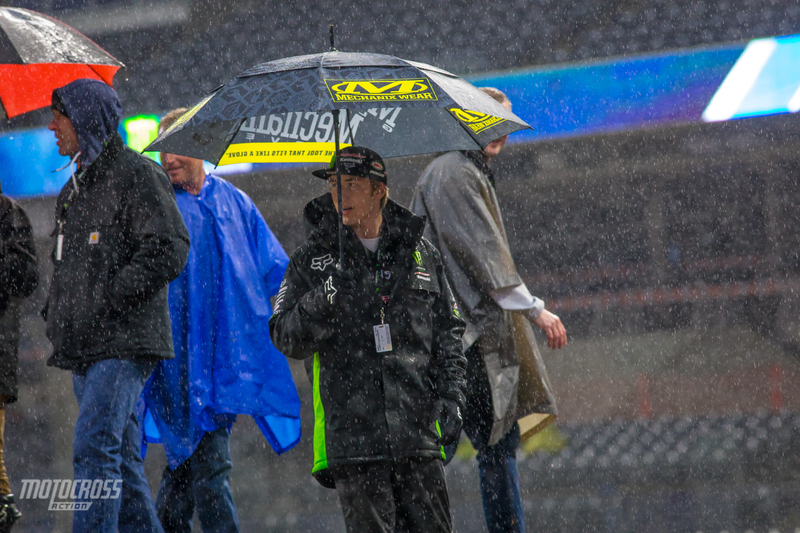 The 250 points leader, Colt Nichols checking out the track. 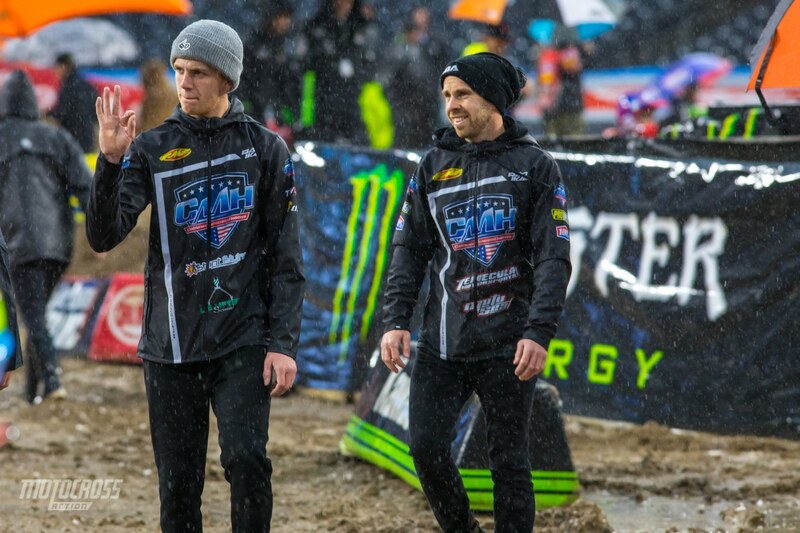 Round five of the 2019 Monster Energy Supercross season started off slow. 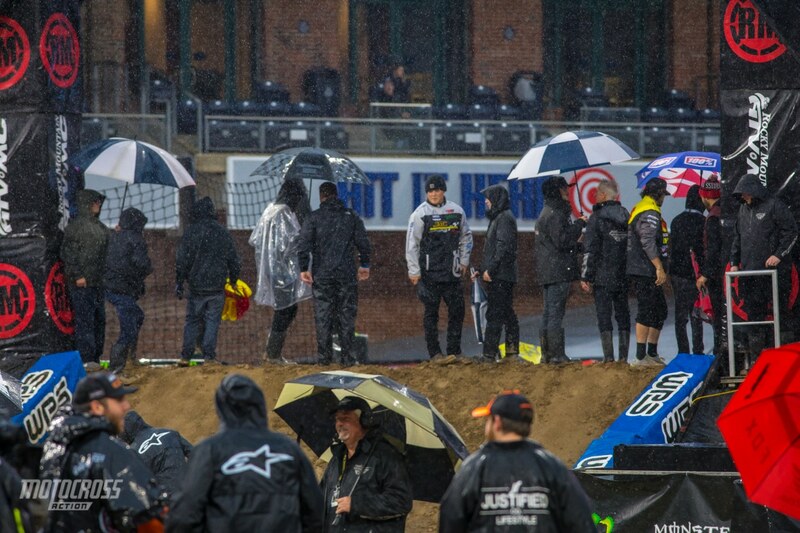 With the rain that was coming, the Dirt Wurx and Feld crews decided to keep the track covered and alter the schedule in hopes of saving the track for the night show. Now the riders will only have one timed qualifying session and from that practice we will take the top 40 straight into the night show. Things are starting to speed up now as we get ready the qualifying sessions to start. 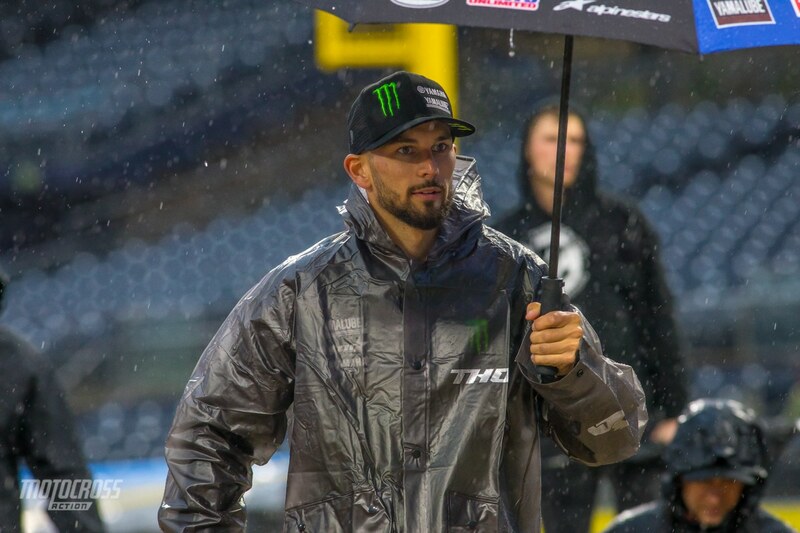 Enjoy this wet track walk gallery while you wait in anticipation for round five to get started and keep checking back in with us throughout the night for updates on results, news and photos from round five. 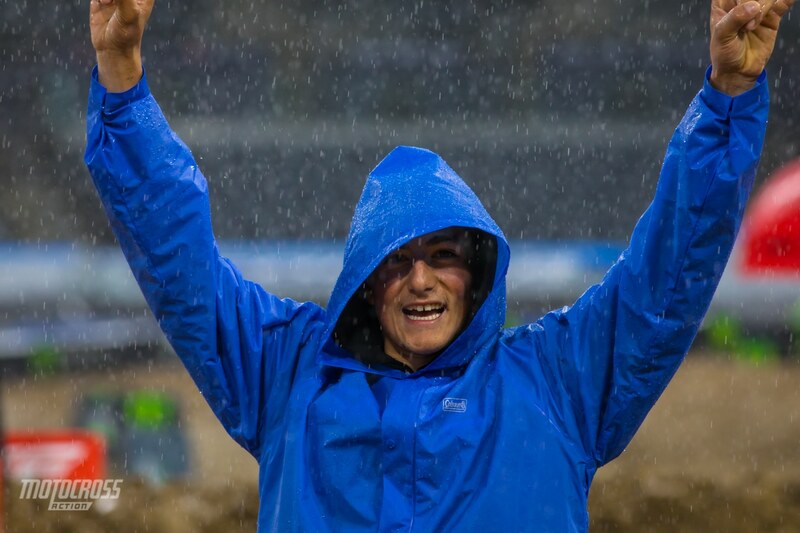 450 points leader, Cooper Webb has his game face on. 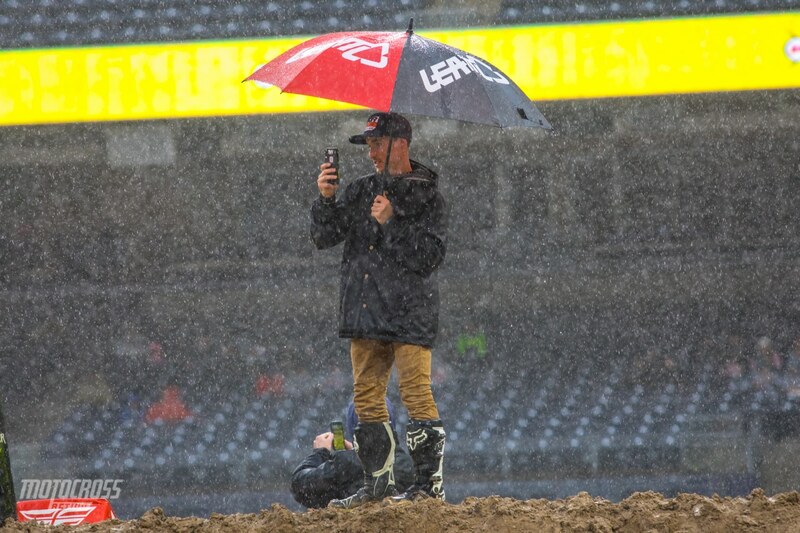 A few weeks ago, nobody would’ve expected rain San Diego Supercross. 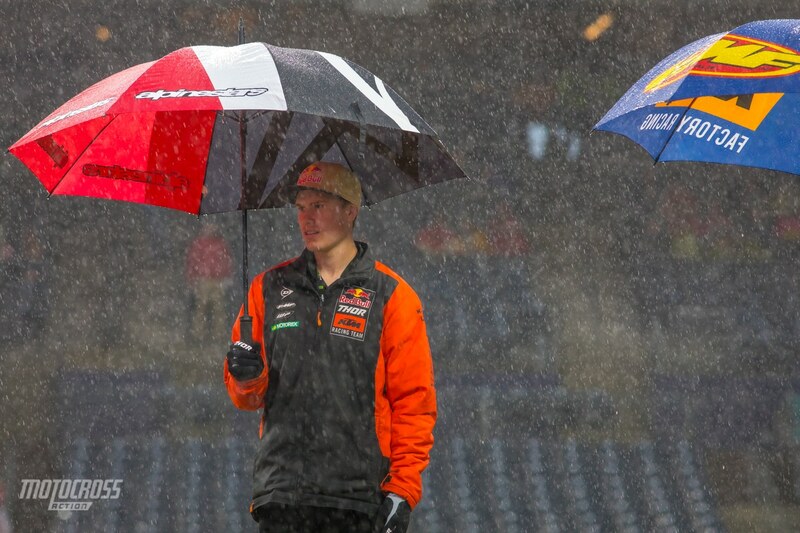 Isn’t it supposed to be dry in California? 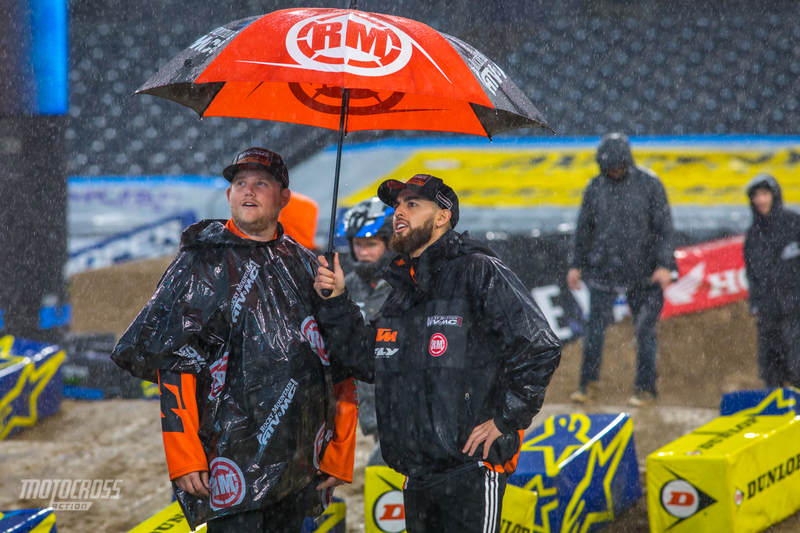 Cameron McAdoo is interested to see how this track will turn out. 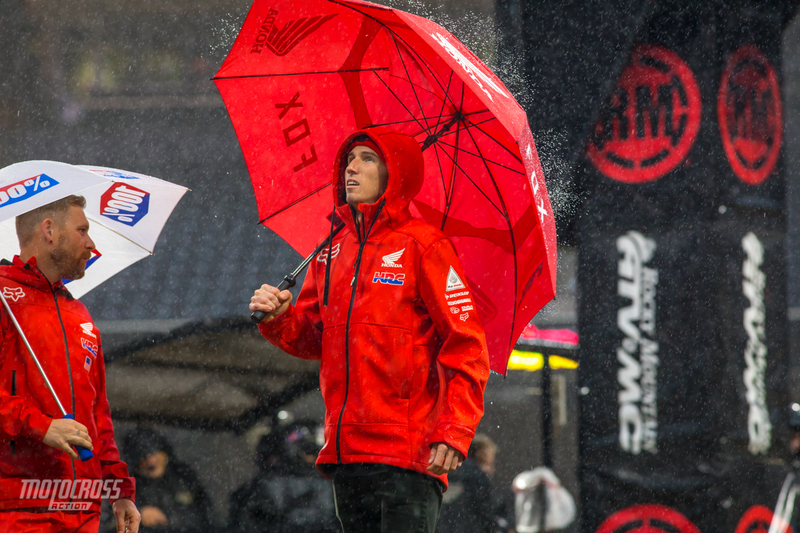 Cole Seely checking out the clouds. 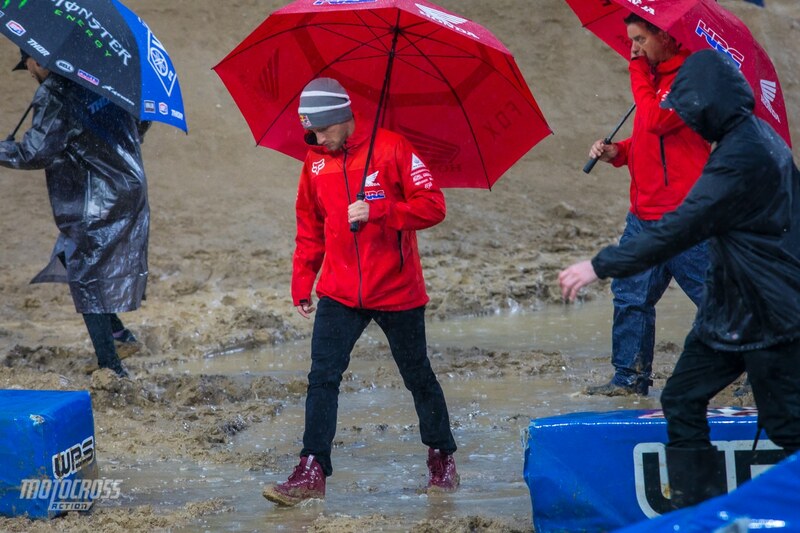 Canada’s Jess Pettis should be good in the mud! 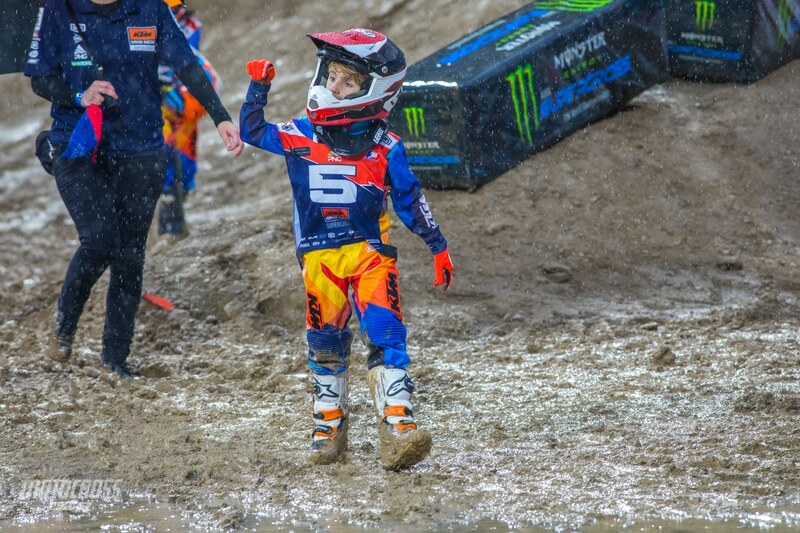 This KJSC 50 rider is excited to play in the mud and his parents are happy that they don’t have to wash the bike afterwards! Some of the guys are pumped for the mud! 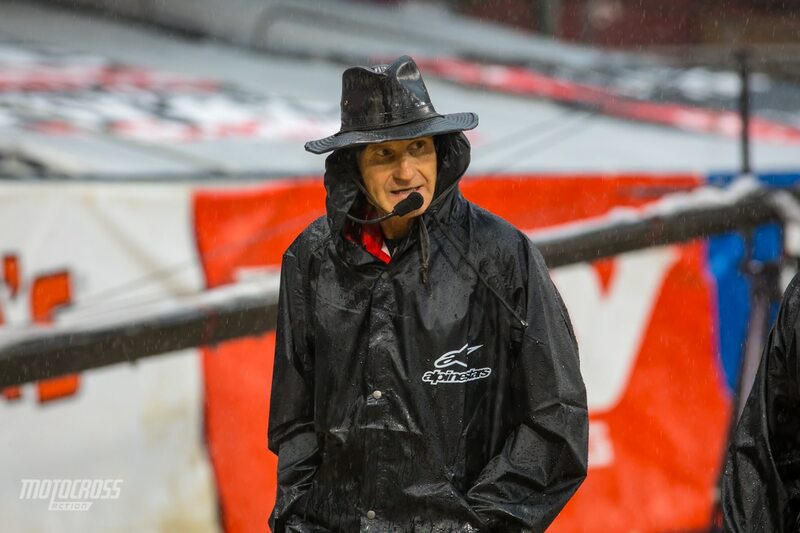 Trey Canard is smiling too. We talked with Trey earlier and he’s been in California off and on for a while now. He’s helping the HRC Honda team with testing during the week and he’s been at most of the races to lend a helping hand. Debating whether or not the riders will be jumping through the rhythm sections or not. 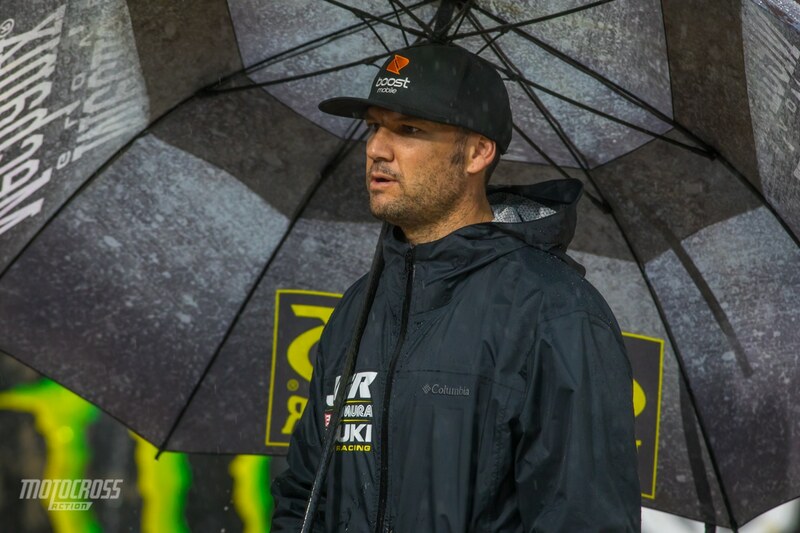 Chad Reed has won six times in San Diego. 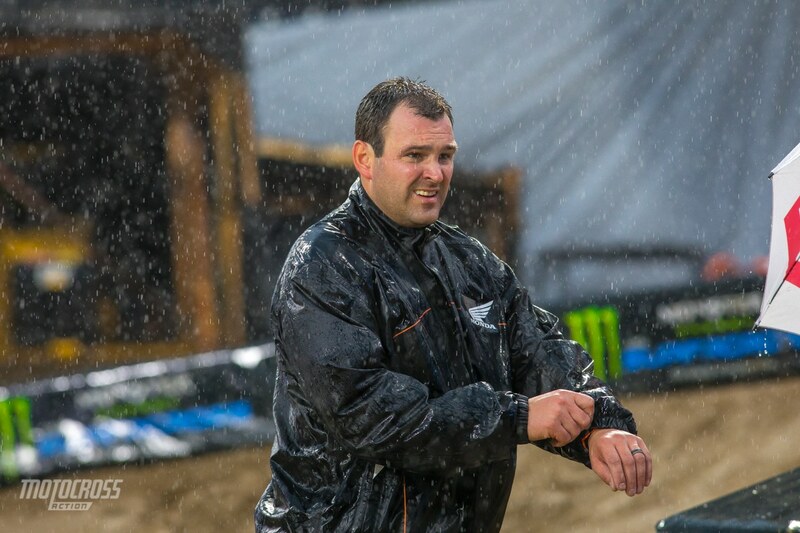 With the muddy conditions, we’re sure Chad is hoping for a seventh win. 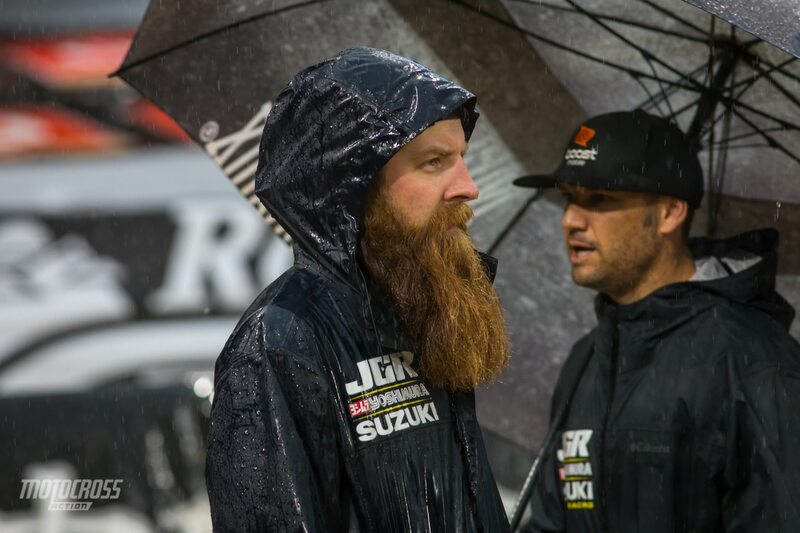 Chad Reed’s mechanic, Ben Schiermeyer has one of the best beards in the pits. 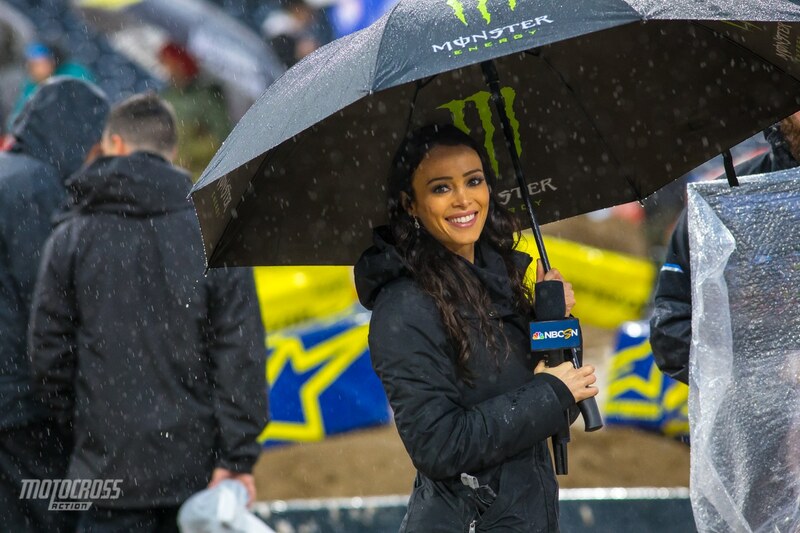 Jade Dungey braves the storm without a hat or umbrella. Juliana Daniell is still smiling! 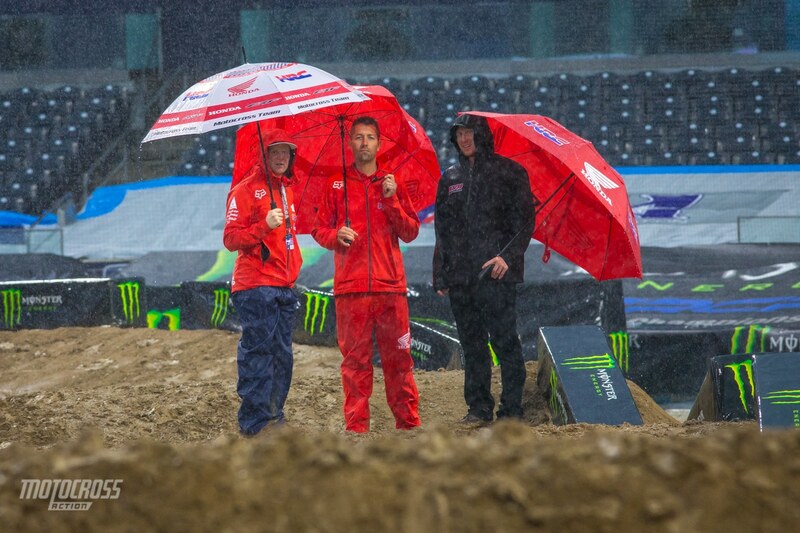 Ken Roczen navigates his way through the puddles. 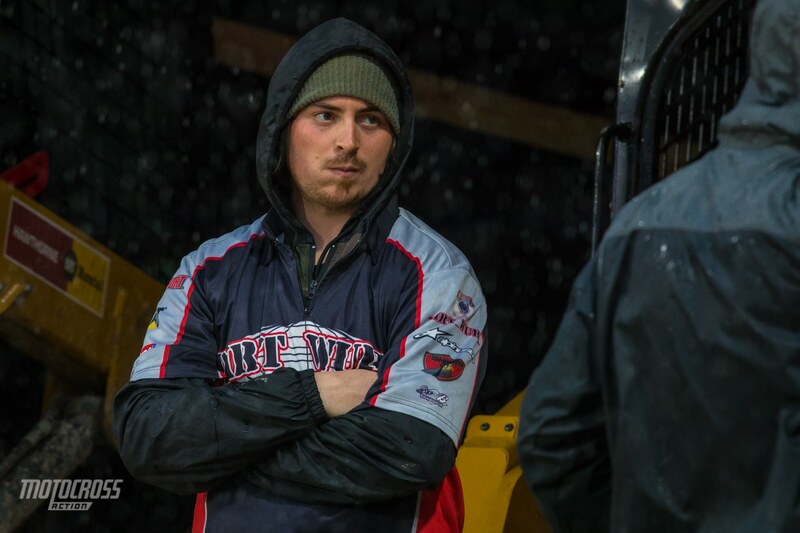 Thank you to the Dirt Wurx crew for all their hard work. They have done their best to give us a great race track. 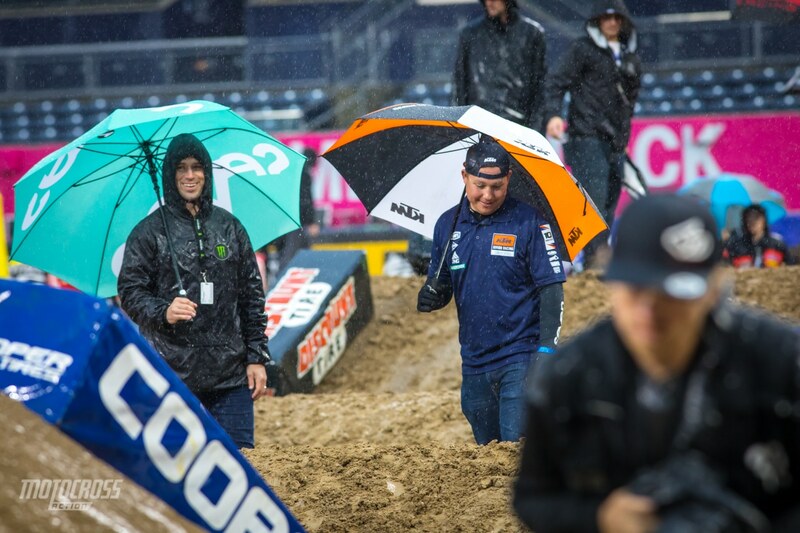 Dr. Alexander is one of the doctors on scene at the Supercross races. 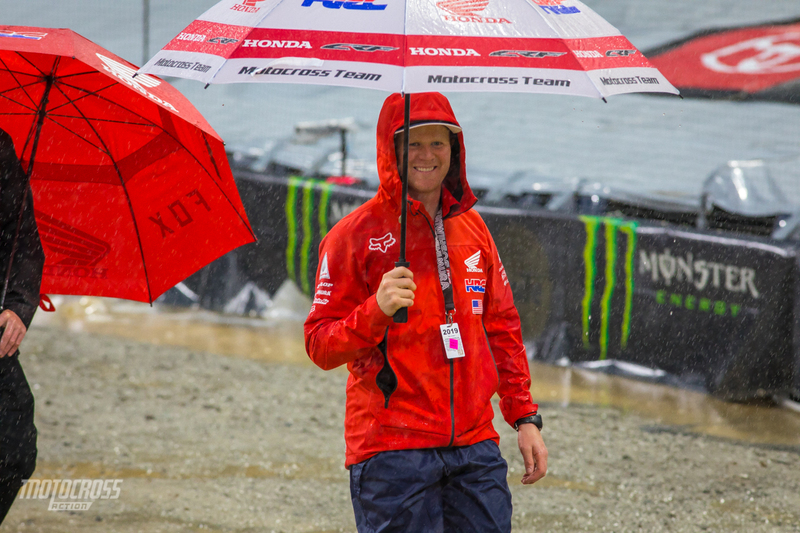 He picks riders up off the ground, he looks over the injured riders in the Alpinestars mobile medical rig and he also works full time as an orthopedic surgeon during the week. 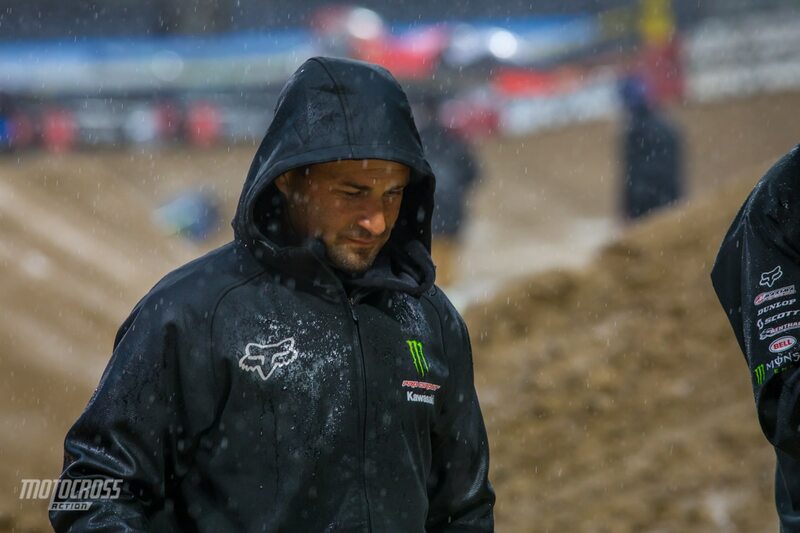 Dr. Alexander has performed surgeries on many of the top Supercross riders. This rider is documenting the track walk via iPhone. 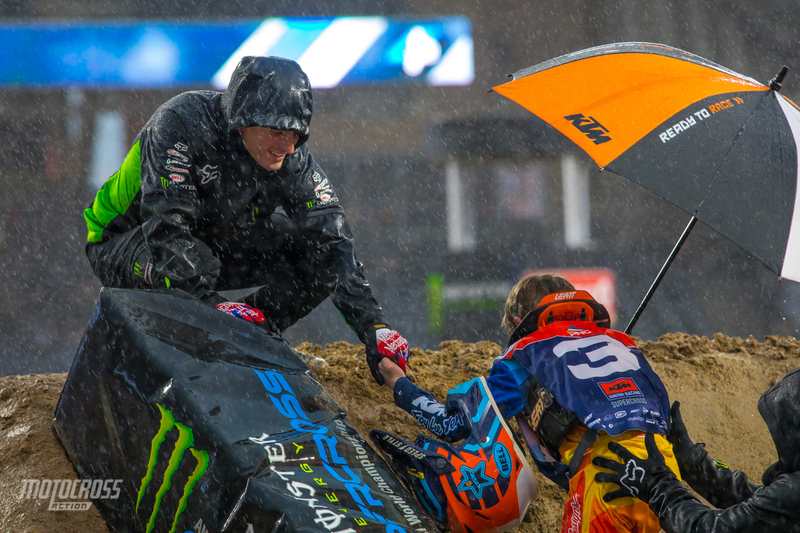 One of the Pro Circuit Kawasaki crew members helps a young KJSC 50 rider up a jump. 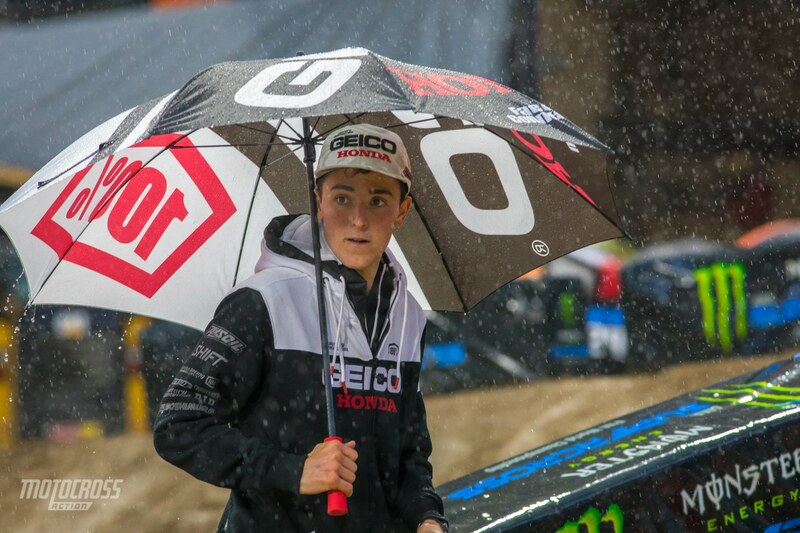 The rookie, Garrett Marchbanks probably wasn’t expecting another mud race in California. 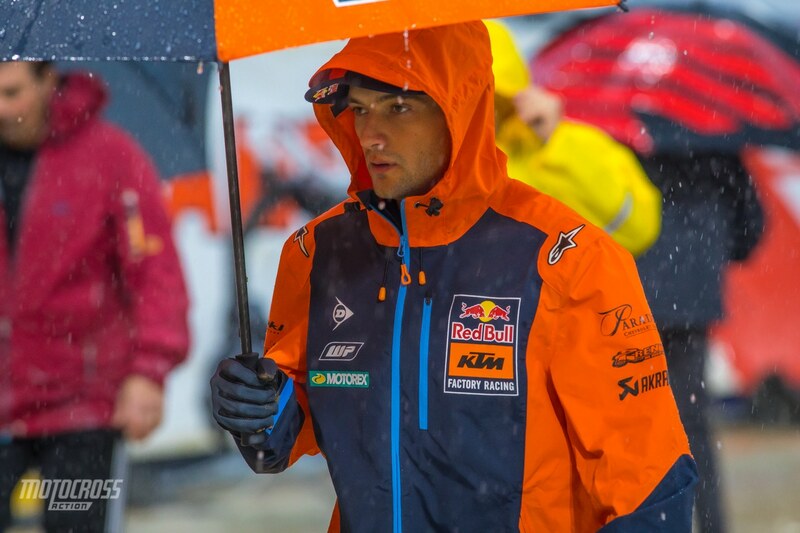 Ivan Tedesco is probably glad that he’s not racing tonight. 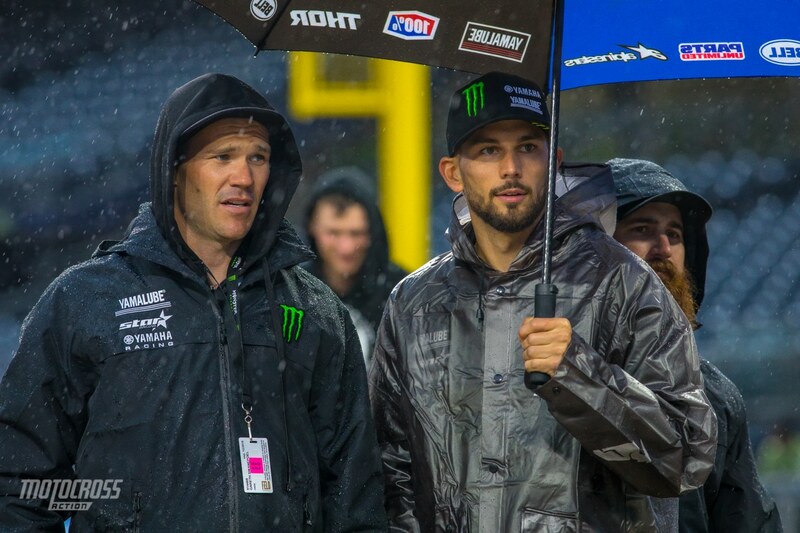 Dylan Woodcock and Michael Carter from California Motocross Holidays checking out the track. Colt Nichols and his trainer Gareth Swanepoel checking it out while Colt’s mechanic Trevor Carmichael sneaks into another picture. 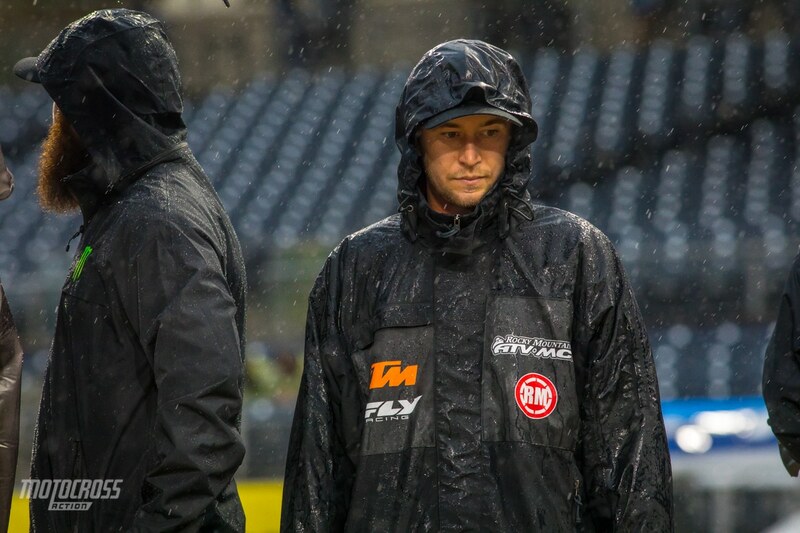 Maybe Blake Baggett is thinking about all the times he’s ridden in the mud at his house in Florida? 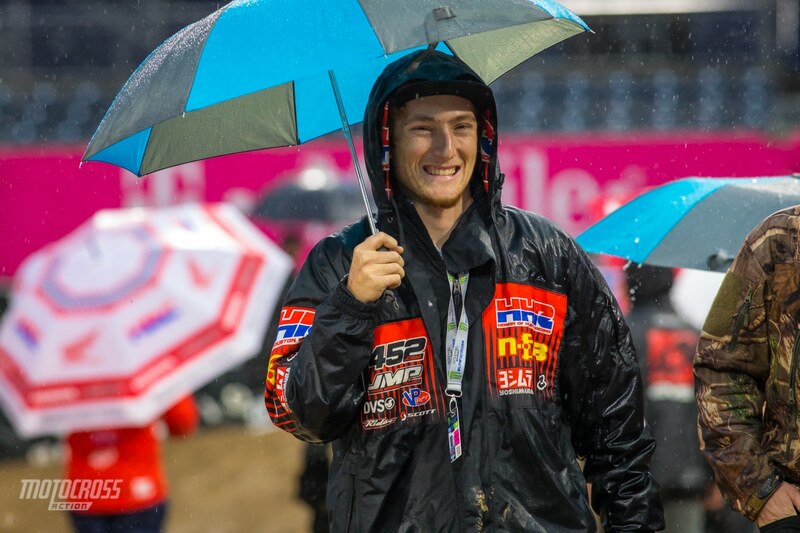 Vann Martin is from Texas and he’s excited to ride in the mud. Tyler Bowers having a laugh with one of the KJSC 50 Dads. 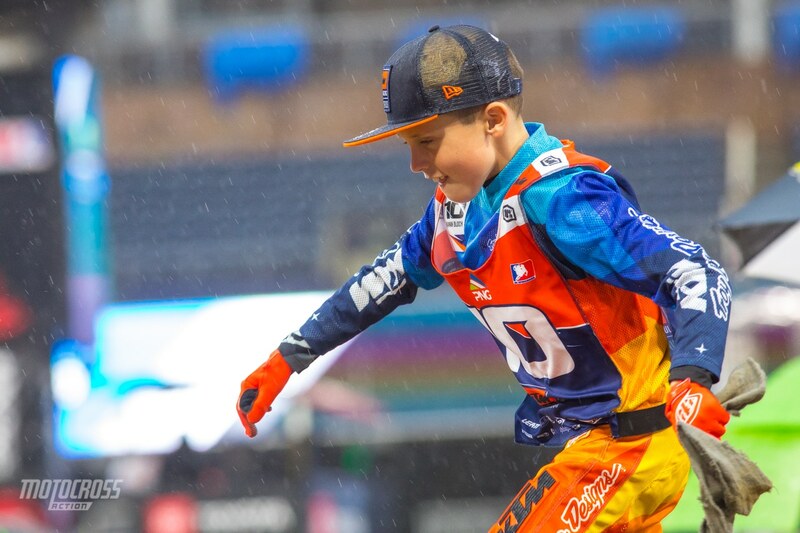 The kids are still having fun… Keep checking back in with MXA throughout the night for updates on results, news and photos from round five!